This question concerns the family of Alfred Clarke, who served in the 4th Brigade of the Royal Artillery. They appear in some of my previous questions, including Were British Army families stationed overseas enumerated in any Census returns? 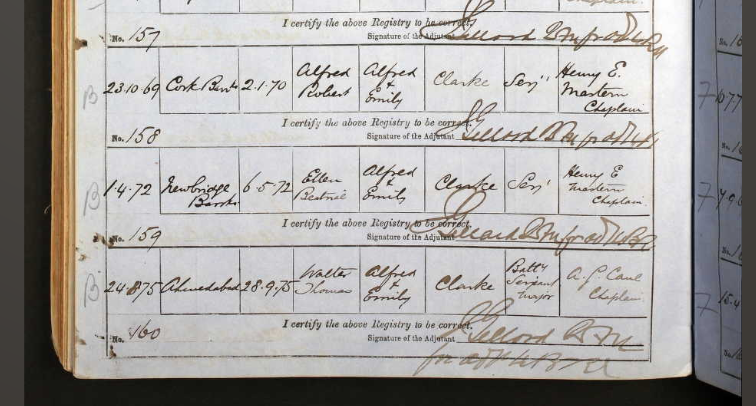 Three of the children -- Alfred Robert, Ellen Beatrice, and Walter Thomas -- appear on the same page of a baptism register in Ancestry's collection UK, British Army and Navy Birth, Marriage and Death Records, 1730-1960. Register of Marriages and Baptisms, 4 Brigade Royal Artillery. All the entries below appear on folio 30v. The folio number is to be found in a circle at the top right of each folio. Entry 88: Charles SALTER, of 4 Brigade Royal Artillery, and Margaret CONSIDINE married on 10 November 1870 at Morristown Villa, Kildare. Entry 89: Duncan McKENZIE, of 4 Brigade Royal Artillery, and Emma WHITE married on 13 November 1870 at Plymouth. Entry 90: Alfred CLARKE, of 4 Brigade Royal Artillery, and Emily KNOWLES married on 24 January 1869 at Woolwich, Kent. However, I don't expect all catalog records at an archive to have all the names of the people who are in the records. What's the most efficient way to narrow down which register we've looked at, when the individual's name doesn't appear in the catalog? I started from the catalog entry for Alfred and Emily's marriage, which was WO 69/554/30, looked below at the grey box marked Context of this record, and chose the link to Browse by Reference. Register of Marriages and Baptisms, 4 Brigade Royal Artillery. (Described at item level). Index to marriages on folios 2 to 15. Marriage register on folios 16 to 87. Index to baptisms on folios 88 to 101. Baptism register on folios 102 to 171. The Marriage Register and the Baptism Register have been indexed. The Indexes have not been indexed but should be consulted as they sometimes record additional information such as the date of a soldier's death, transfer or discharge and whether on the married establishment or not. Entry 161: Mary Jane, a child of Thomas LUDFORD of 4 Brigade Royal Artillery and Anne, was baptised on 29 October 1865 at Toronto CW. Note: Born 21 August 1865. All the entries below appear on folio 111v. The folio number is to be found in a circle at the top right of each folio. Entry 153: Anne, a child of Charles SALTER of 4 Brigade Royal Artillery and Margaret, was baptised on 5 February 1871 at Newbridge. Note: Born 27 January 1871. Entry 154: Duncan Richard, a child of Duncan McKENZIE of 4 Brigade Royal Artillery and Emma, was baptised on 5 November 1871 at Plympton. Note: Born 28 October 1871. Entry 155: Roderick, a child of Duncan McKENZIE of 4 Brigade Royal Artillery and Emma, was baptised on 15 March 1874 at At Sea, HM Ship "euphrates". Note: Born 26 January 1874. Entry 156: Catherine Ann, a child of Duncan McKENZIE of 4 Brigade Royal Artillery and Emma, was baptised on 15 February 1876 at Kirkee. Note: Born 31 January 1876. Entry 157: Patrick James, a child of Patrick KING or FLYNN of 4 Brigade Royal Artillery and Catherine, was baptised on 16 September 1875 at Belgaum. Note: Born 23 August 1875. Entry 158: Alfred Robert, a child of Alfred CLARKE of 4 Brigade Royal Artillery and Emily, was baptised on 2 January 1870 at Cork Barracks. Note: Born 23 October 1869. Entry 159: Ellen Beatrice, a child of Alfred CLARKE of 4 Brigade Royal Artillery and Emily, was baptised on 6 May 1872 at Newbridge Barracks. Note: Born 1 April 1872. Entry 160: Walter Thomas, a child of Alfred CLARKE of 4 Brigade Royal Artillery and Emily, was baptised on 28 September 1875 at Ahmedabad. Note: Born 24 August 1875. Covering dates are those for the earliest and latest entries on this folio. The information in these entries agrees with previously collected records such as the Slapton School Registers, which makes me reasonably certain this is the same family. My next step will be to browse back to the indexes on Ancestry to look for other information, as TNA suggested. The information in the Army register matches the information from the parish register St Mary Magdalene, Woolwich, Kent. The bracket indicating "signed" suggests the entry is a copy of other records (the participants did not sign the Army register). This particular piece (register) is different from all the other regimental records of births/baptisms and marriages previously collected. Not the answer you're looking for? 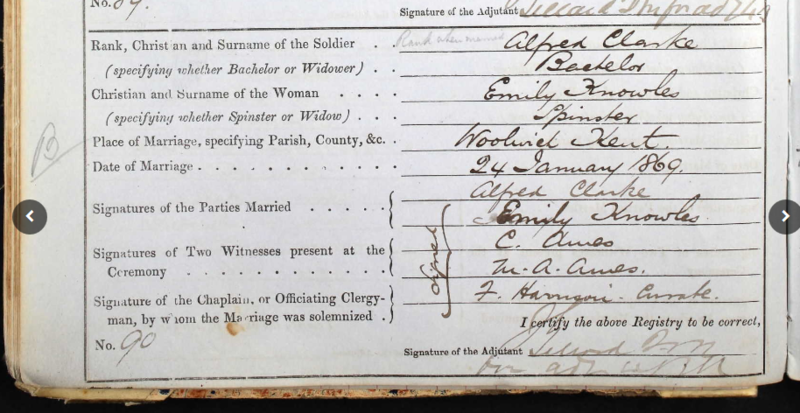 Browse other questions tagged 19th-century england military-records baptism-records archives or ask your own question. Were British Army families stationed overseas enumerated in any Census returns? Finding birth record of Pierre Louis Oscar Cordier, Frenchman who married (1869) and died (1882) in London? Organizing geographical reference material for English parishes? Did Richard Hill and Blanche Todd live in India in the late 19th Century? Tracing ancestor CF Evans who died in World War 2 (aged 39 in 1945)? How can I distinguish between name changes and missing records?